They Might be Giants - then again, they might just be the work of Raoul Josset, the tiny Franco-American sculptor who weighted down the Texas landscape with his larger-than-life statues. Born in France in 1899, Raoul Jossett was trained at the Paris School of Fine Arts, the Lycee of Lyons and Paris and studied under famed sculptor Antoine Bourdelle. 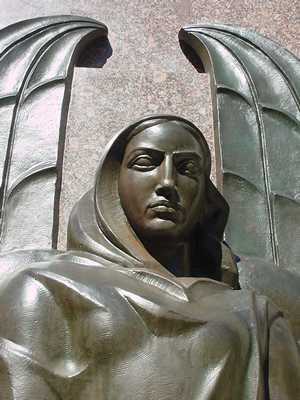 Between 1920 and 1926 he created more than 15 memorials in France. He was awarded the Rome Prize in 1923 and the Prix Paris for the years 1924, 1925 and 1926. Not bad for a man in his twenties. 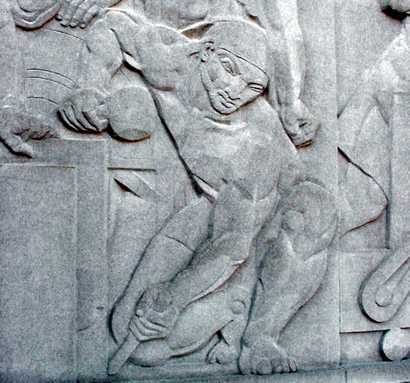 He left Europe for the United States in 1933 and received his first commission carving two 45 foot granite Indians for the George Rogers Clark Memorial Bridge at Vincennes, Indiana. The following year, while working on two major Chicago works, Raoul became Citizen Josset. Statue of concrete and plaster carved by Jose Martin. The reflection pool also provided by Josset and Martin. 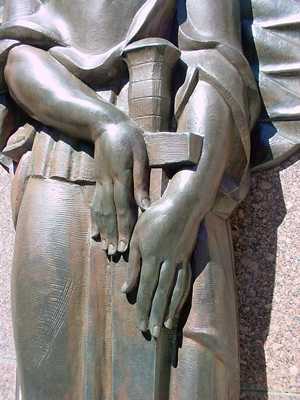 Texas was having it's Centennial in 1936 and Josset came to Dallas where he created the statue Spirit of the Centennial in Dallas' Fair Park and also made matching statues for the exhibits of the United States, France and Mexico. 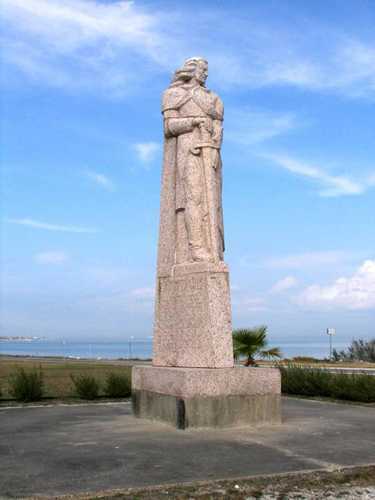 His Memorial to Captain King, a bronze and granite allegorical piece 30 feet tall in Refugio was never officially accepted by the county - since the single male figure was unclothed. It's still there across from the Refugio County courthouse - patiently awaiting acceptance. The eight-foot bronze statue of George Childress at Washington-on-the-Brazos stands today outside the Star of the Republic Museum. The statue has been removed from its long base that once counter-balanced a weighty inscribed granite marker. 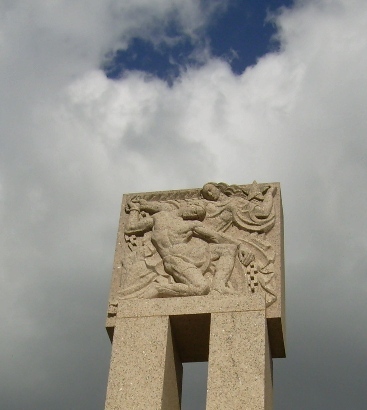 Another allegorical work of Josset is the memorial to the men of Fannin's command that were killed at Goliad. 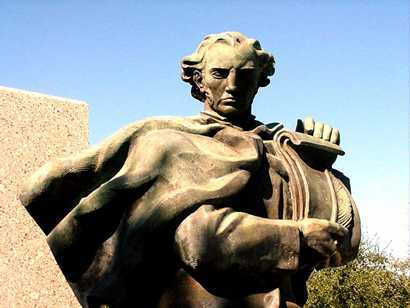 In addition to his many statues, he also created 20 bronze plaques for various Texas counties. At Monument Hill just south of La Grange, Josset's huge bronze angel guards the crypt containing the remains of Texans killed in the Mier-Sommerville expedition. His statue of La Salle (also 30 feet tall and made of granite) stands near the site of the lost town of Indianola. 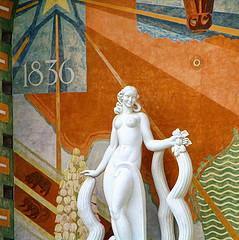 One of Josset's least seen (but more interesting) works can be found at the Grand Lodge Masonic Temple in downtown Waco. 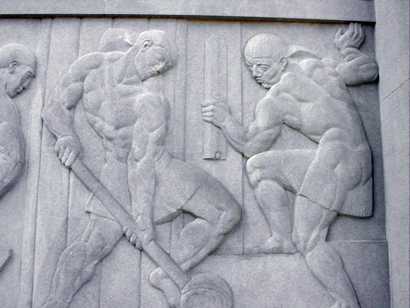 The stone 7 foot x 75 foot bas-relief depicts the construction of the Temple of Solomon. 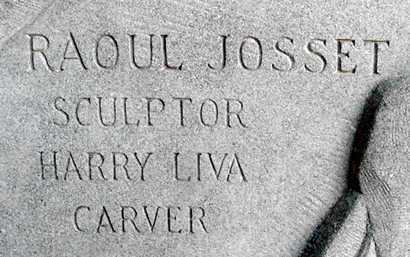 Carver Harry Liva worked with Josset on many of his projects. Josset entered a plan for the Jefferson Memorial in Washington, D.C., but came in second. He did win a commission in Philadelphia during WWII for a bronze statue of Lafayette at the Philadelphia Museum of Fine Arts. He became an Associate Member of the National Academy of Design in 1954 - one of the highest artistic honors in the United States. Josset was proud of his work without being vain and he was proud to be called a Texan. Of Texas, Josset said, "There is money and enthusiasm here and people know what they want. They choose with an eye of permanence, thinking in terms of years, generations, maybe forever." Concerning art, "Purity of line is the most important thing,' Josset said. "In all forms of sculpture preceding the Gothic period there were magnificent works, [but] it was the Gothic who brought the purity of line to their work. It was the Gothic who taught the stone to pray." Josset in stature was miniscule compared to his titanic sculptures. Petite with curly hair, Raoul was once described as looking "somewhat like a mischievous cherub." Josset died on June 29, 1957 and in his obituary - written by his friend Jack Sheridan and published in the Lubbock Avalanche-Journal, Sheridan wrote: "Texas has been privileged to receive the fruits of his artistry to hold for all time in heritage." Perhaps Refugio County will find the time to formally "accept" their Josset sculpture.